Nose: Rather floral, slightly fruity. Orange confit and prunes. Palate: More flower flavors and candied fruit. An intense flavor of almonds and hazelnuts. The finale is strong, with notes of cocoa and leather. Spice and smoky hints come to the fore. Experience a delightful blend of eaux-de-vie from the Fine Champagne, Fins Bois and Bons Bois crus with the Meukow XO Cognac; bottled in the iconic panther carafe. The delicate nature of the Grande and Petite Champagne crus together in this Cognac make for a seriously refined spirit; that combined with the sweetness of the Fins Bois and Bons Bois crus and you can see why this is such a masterful Cognac. The fruity blend combines the tannins that occur after long ageing on Limousin oak barrels, and you will be transported on a true sensory journey. Of course, it has the lengthy, powerful finish that you’d expect from a Cognac of this quality. What does such a fine blend of crus bring to the palate? Meukow demonstrate a expertise when it comes to blending; selecting eaux-de-vies from completely different crus and melding them together. The Grande Champagne, which are generally highly sought after, is considered to be the “Premier Cru” in that the soil is very chalky, and makes for fine and pure Cognac. This is a result of the years of fossilization that has taken place. It also gives the Meukow Extra Old its lengthy finish on the palate. Its floral quality comes as a result of the Petite Champagne, which also makes for very fine Cognac. The Fins Bois and Bons Bois have more of a mixed soil, and give it a roundness that many tasters desire. Cognacs from Meukow Cognac house are one of the few that remain a bonafide family business in the region, and have produced a series of incredible Cognacs using eaux-de-vie from different crus. Originally commissioned by Tsar Alexander II to supply the Russian court with brandy, they were founded in 1862 and have since begun a delightful collection of eaux-de-vies. Read more about the history of the Meukow Cognac house on our blog. 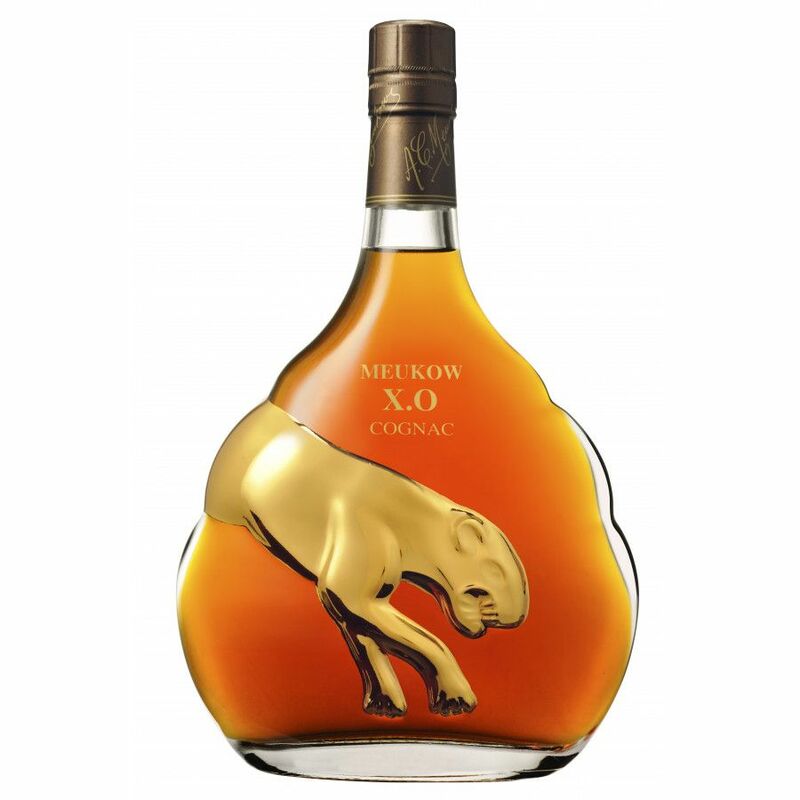 The bottle itself is lovely to behold, adorned with the emblem of Meukow, the panther, in a wonderful golden hue. An award winning cognac that is the perfect addition to any cognac lover's cabinet. And it would make the perfect gift for anyone who appreciates fine things. Enjoy it neat, or over ice. This is the best way to really appreciate a Fine Champagne XO. Spicy and hot is how I would describe this cognac. A burn as it slides down your throat, but let it air a bit more and the second sip is much nicer. Very good XO, in most places amazing value as well. This is a well rounded XO that has a great nose, nice smoothness and is very easy drinking. Lingering palate with stronger vanilla tones, and a very slight expresso/dark chocolate finish. If you like round and rather sweet cognac, this is your bottle! I personally really like Meukow's design with all that gold.. and those bottles are unique. Their extra old cognac is really solid, the palate is round and a bit sweet.. the finish has some spices without overly dominant burn. Tres bon!